We’d love your help. Let us know what’s wrong with this preview of Eat Cake. Be Brave. by Melissa Radke. My name is Melissa Radke, and there is a very real chance you have no idea who From the star of The Radkes, the reality show premiering on USA network on June 4, this is the hilarious, heartbreaking, and inspiring journey of one woman learning to stand up for herself in a world of naysayers, by the creator of the "Red Ribbon Week" video, which has over 150 million views. To ask other readers questions about Eat Cake. Be Brave., please sign up. Be the first to ask a question about Eat Cake. Be Brave. 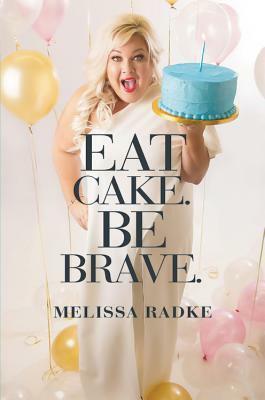 I have been thinking about cake for the last eight hours and, in case you’re wondering, it’s most certainly Melissa Radke’s fault. And it’s torture because I’m trying to eat healthy food only for the next two months to see how my body reacts. Thanks a lot, Mel. Melissa Radke was right when she said that whoever picked this book up would end up loving her. I didn’t know her before, and I still don’t know many things about her, yet I can’t help but feel like we’ve become friends somehow. 3.5 stars. Melissa Radke was right when she said that whoever picked this book up would end up loving her. I didn’t know her before, and I still don’t know many things about her, yet I can’t help but feel like we’ve become friends somehow. A one-sided relationship, no doubt, but it has been a privilege reading these stories. I even checked her popular ‘‘Red Ribbon Week’’ video immediately after closing the book and I damn well recognized the woman I’ve been reading about for the past hours. Melissa is someone who writes with feelings, not words. She uses words to convey her emotions, but they’re not what she needs to express a thought or relate an event. Her stories are intense because she, herself, is intense. You easily hear her personality and tone in the narration style. I often forgot I was reading a book and had the impression I was spending an afternoon at a coffee shop with the author herself. But as much as I came to adore Melissa and sympathized with her as she was telling us about her failed pregnancies, miscarriages, and marital problems, I do have to mention that these stories are extremely short. I am immensely happy that this book was published because there is substance in it and humour almost everywhere, but I would have preferred if Melissa had focused on less than more but in a sometimes shallow way. In other words, she often skims or mentions an issue multiple times before even getting to it. For example, we know from the beginning that she has been married for longer than two decades and that at least six of those years were unhappy. She says it a couple of times. But when she actually gets to talking about what drifted her and her husband apart, she discusses it very briefly, mentioning only the main events, although it seemed to be on her mind always. It’s as though she wants to be open but not TOO open. This is Melissa’s first book and it isn’t perfect, but the short stories are either meaningful or entertaining. Sometimes both. Melissa says she decided to be brave when she turned forty, but you know what, I think she was very brave from the moment she set foot on this earth. If she ever writes another book, I'll be there for it. I’m no bookworm and yet from the preface to the end I couldn’t put this book down. Her pictures in between the chapters bring familiarity to the upcoming and previous chapters within the book. Through the words to her kids, husband, mother and other woman in her family whom she calls her chicken fried woman, and many more brings to life the kind of person Melissa is and the person many readers including myself inspire to be like......BRAVE. Melissa Radke knocked it out of the ball park with her first book!!! Her story will have you laughing one minute and in tears the next as she shares her life story! Once you start, you won’t want to put it down!!! INCREDIBLE! Grab a piece of cake a glass of Sweet Tea or Diet Coke amongst your dirty laundry, screaming kids and undone homework. This is worth the read. You will find yourself going, “Yup” or “ I would be her best friend”. ***Spoiler - grab some Kleenex’s and maybe even a whole cake! I find it funny that the week I try and start my new diet, this is the book I pick up and read. It couldn't have been more perfect. Notice the cake in the picture above? It was from my "last hurrah" dinner the night before. Anyway, what I found out about Melissa Radke is that she is a woman who struggles like the rest of us. Melissa has an immensely beautiful way of telling us all about it in a way that makes you feel less alone. THIS BOOK Y’ALL! Seriously, love this book so much. I’m known for starting a book and putting it down within a few minutes. If I’m not sucked in, I won’t finish it. From the moment I started reading the preface all the way to the acknowledgments, I was sucked in. I couldn’t stop reading. This is a perfect summer read especially for a road trip, long flight or just around the pool. You’re not going to want to put it down. You will laugh, you will cry, you might even do both at the same time. It’s THIS BOOK Y’ALL! Seriously, love this book so much. I’m known for starting a book and putting it down within a few minutes. If I’m not sucked in, I won’t finish it. From the moment I started reading the preface all the way to the acknowledgments, I was sucked in. I couldn’t stop reading. This is a perfect summer read especially for a road trip, long flight or just around the pool. You’re not going to want to put it down. I was very delighted with this book it was entertaining from start to end. I read it whenever I was free at work and it was perfect. 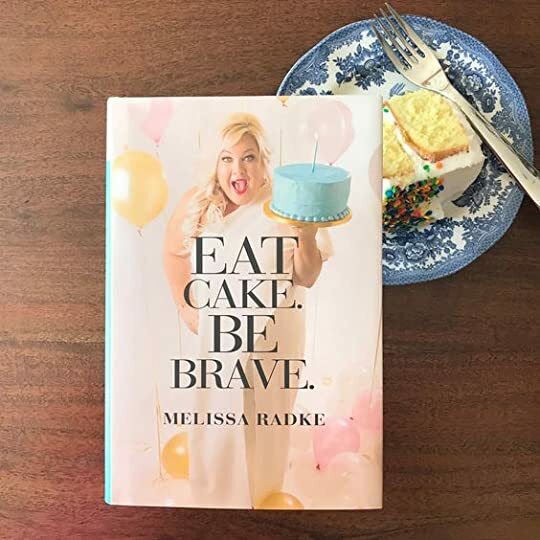 Eat Cake Be Brave is a book I totally recommend to anyone who needs a light read with so much motivation. I loved this book. I literally belly laughed in public a few times, and I shed some tears. If you need a good laugh, a little reflection, or some encouragement this is the book for you. The first time I ever encountered Melissa Radke is when she spoke to my soul about spirit week. It was then that I knew I would follow her and watch everything of hers. There was a particular video I watch where she talks about the year she decided to be brave and not say no anymore. It spoke to me on a whole new level. I am so glad she included that story in her book. I feel that the book would have been missing something had she left it out. The thing about writing a non fiction memoir type bo The first time I ever encountered Melissa Radke is when she spoke to my soul about spirit week. It was then that I knew I would follow her and watch everything of hers. There was a particular video I watch where she talks about the year she decided to be brave and not say no anymore. It spoke to me on a whole new level. I am so glad she included that story in her book. I feel that the book would have been missing something had she left it out. The thing about writing a non fiction memoir type book is that you have to be able to convey what you were feeling in that moment to your prospective audience. Melissa does an amazing job of including the reader in her story. She talks directly to the reader on more than one occasion. The writing style was what you would expect if you have seen her videos. I read it just as if she was speaking every word to me directly. Her voice echoing in my mind. (I can't wait to hear the audiobook). Personally, on books like this I like the personal flare in the writing. If it where a traditional non-fiction where the third wall isn't broken it wouldn't have worked. She knows how to appease her prospective audience. The feelings change with every chapter she writes. The more personal chapters about her marriage I felt as though I fell on the floor with her when I heard the phone conversation. I was with her when she returned home and then returned to Tennessee. I was with her when she was on the phone with her father desperately needing a little push to get out the door and have a good time with her friends. She brought me along with her when she tried out with the voice, when she was in college, and when she birthed her first born. I felt every emotion she felt and that my friends is not easy to do when you are a new writer. However, I was there, she took me there. This book will make you laugh, cry, and think at times she may have been reading your mind. I don’t know how she does it but you will feel like you are having a personal conversation with her one on one. You feel the heartbreak from her life and sometimes want to go punch someone. All high school girls, and anyone who has been a high school girl, NEED to read Eat Cake. Be Brave. You will realize you are not alone and there is life after the hurt. This woman has helped me heal some things in my l This book will make you laugh, cry, and think at times she may have been reading your mind. I don’t know how she does it but you will feel like you are having a personal conversation with her one on one. You feel the heartbreak from her life and sometimes want to go punch someone. Listen!!!! If you are looking for 100% realness and all of the feels, this is THE book for you!! Eat Cake. Be Brave. takes us all on a journey through the ups and downs of Melissa’s life. Just go ahead and grab your Kleenex because one chapter will have you laughing until you are crying, while the next sends you into a full-on ugly cry (or was that just me??). Do yourself a favor....grab this book, your Kleenex and join us all as we are eating cake and being brave!! This book will make you laugh and make you cry. And then make you laugh some more. It is raw and wonderful. Melissa Radke bares her soul with her first book and makes you love her and her family along the way! Do NOT Miss the Opportunity to Read this Incredible Book! If you struggled with weight issues, miscarriages, low self-esteem and need some good natured humor, this is a must! Unlike some of the readers of this book, I did not know that Melissa Radke was famous! After reading the book it is obvious why, she is so popular: great sense of humor; intensely honest; she has overcome the loss of 5 children (I know that pain to well, and I have been healed through God's mercy but it was a long road) as i Do NOT Miss the Opportunity to Read this Incredible Book! If you struggled with weight issues, miscarriages, low self-esteem and need some good natured humor, this is a must! Unlike some of the readers of this book, I did not know that Melissa Radke was famous! After reading the book it is obvious why, she is so popular: great sense of humor; intensely honest; she has overcome the loss of 5 children (I know that pain to well, and I have been healed through God's mercy but it was a long road) as it was for her; she suffered her youth and adulthood as being overweight (and was abused for it -been there too); she has overcome her issues by acceptance that life is hard and we must let go; love others, love them when they hurt you terribly; her loyalty; and her carpe diem attitude (live in the moment). While some parts are so serious, there are some parts that were hysterical! Much of the book is shaped by how others students saw her as imperfect because of her weight. Her humiliation led her to spend 3rd grade eating lunch in the bathroom because she wasn't slender and had no friends. Her mother was such a positive influence and shared insights that began the climb to be brave. At times, Melissa is a bit irreverent and including some of her stunts! Initially I was drawn to this book. It seemed so ridiculous, a heavy woman looking like an Olympian and holding a blue cake, for me (bravery was secondary...don't be fooled). Melissa is so kind, she would be the type of friend, I would be honored to know. She shares her Christian values in a very non-offensive way but it is oh, so real. I loved this book. Thank you Melissa Radke for reminding me to Be Brave. I totally enjoyed listening to this audio book. As someone who has been overweight the majority of her life, I too, can relate to the life experiences that Melissa shares. Like many others, I was first introduced to Melissa Radke with her Red Ribbon Week video. This video had me rolling and sharing. Then came more videos. Some gave me laughs and some had me reaching for the Kleenex. This book was no different. Melissa is a brilliant storyteller and she has the ability to summarize it into a lesson we can all relate to. Her heartaches and desperate moments are gut-wrenching, but word by word, line by line she pulled us out right alongside her. If you're fearful you'l Like many others, I was first introduced to Melissa Radke with her Red Ribbon Week video. This video had me rolling and sharing. Then came more videos. Some gave me laughs and some had me reaching for the Kleenex. If you're fearful you'll be wiping away tears the entire time you read Eat Cake. Be Brave., I assure you, you won't. You'll definitely laugh and will probably snort like I did. For sure you'll annoy the people around you with your spontaneous outbursts of joy. The only drawback to this book is that it took her 43 years to write it. Get the hard copy so you can underline, highlight and make notes. Because every page has nuggets you'll want to remember. Melissa I hope you're working on your second future bestseller. This one is golden. I've read MANY books...MANY!!! I thought this might be a good read with an inspirational message but SERIOUSLY!!! I found myself laughing then snorting...tears in my eyes to reaching for the box of kleenex...feeling frustrated to wanting to punch people in the face...wanting to high five Melissa to really doing a cartwheel for her (You're welcome!). I went into the bathroom stall and ate lunch with her. I went to every cheerleading tryout and every audition. I felt the pain of those deprecating t I've read MANY books...MANY!!! I thought this might be a good read with an inspirational message but SERIOUSLY!!! I found myself laughing then snorting...tears in my eyes to reaching for the box of kleenex...feeling frustrated to wanting to punch people in the face...wanting to high five Melissa to really doing a cartwheel for her (You're welcome!). I went into the bathroom stall and ate lunch with her. I went to every cheerleading tryout and every audition. I felt the pain of those deprecating tattoos being etched all over my skin as they were etched on hers. I was there when her heart was shattered in so many pieces from infertility to loss of a child to a deep betrayal of trust. I wept with her. But, she wouldn't let me stay in tears, not sad tears anyway, not for long. Almost as quickly as I began to cry or got angry over injustice, she would interject her humor or a hilarious story that had me snorting and crying from laughter. It was like the roller coaster of emotions I felt when I watched the cemetery scene of Steel Magnolias. You know, when M'Lynn is having an emotional outburst (understandably so) and says she just wants to hit somebody hard until they feel as bad as she does. Clairee grabs Ouiser by the shoulder and says, "HIT THIS! GO AHEAD M'LYNN, SLAP HER!" And as hard as the tears are flowing, you suddenly break out into a hysterical laughter....snorting and snotting the whole time. It sounds gross but it's a lovely experience. You just feel all the feels simultaneously, or so it seems. And that's what this book was like for me. If I could sum it up into a description you might understand, it would be that scene from Steel Magnolias. I think that's fitting. Melissa comes from a long line of strong, southern Steel Magnolias. Steel Magnolias know how to take the pain, hurt, and loss in life and turn it into healthy, joyful redemption. She knows who she is because she knows to WHOM she belongs. She's unapologetically "too much" for some but she'll never be "not enough" again. If you ask me, I'll say, "She's BRAVE!" This book blends the harsh reality of the world we live in and all the humor of a sassy, Southern woman and wraps it up in the love of Jesus. The amount of life Melissa Radke has walked and the things she's experienced and endured could shatter a person, but she eloquently spills each thread of her heart onto the pages of this lifelong journey and bravely shares it with you. If you're in a hard spot or you need encouragement that not everyone is a Pinterest-worthy, yoga model that bakes cakes in This book blends the harsh reality of the world we live in and all the humor of a sassy, Southern woman and wraps it up in the love of Jesus. The amount of life Melissa Radke has walked and the things she's experienced and endured could shatter a person, but she eloquently spills each thread of her heart onto the pages of this lifelong journey and bravely shares it with you. If you're in a hard spot or you need encouragement that not everyone is a Pinterest-worthy, yoga model that bakes cakes in her spare time while speaking three languages...READ THIS BOOK! It is not only relate able and real, it's funny! and hopeful! and honest! and so much more. She doesn't set an impossible standard or belittle small accomplishments that pave the way to the life change. I laughed, I cried, I laugh-cried. This book calls out the warrior in all of us but holds your hand if you're too scared of what brave might look like. I really enjoyed "Eat Cake. Be Brave." I am as old as dirt and the message still applied to me, and I am sure it would apply to a teenager, or a 30 year old. Melissa does not "make you" laugh or cry, she invites you into her experiences and gives you room to see where it fits into your own. Although it is emotional, entertaining and funny at times, Melissa really is striving to teach us. There are times in a chapter that you think she has already explained something previously- and she is explai I really enjoyed "Eat Cake. Be Brave." I am as old as dirt and the message still applied to me, and I am sure it would apply to a teenager, or a 30 year old. Melissa does not "make you" laugh or cry, she invites you into her experiences and gives you room to see where it fits into your own. Although it is emotional, entertaining and funny at times, Melissa really is striving to teach us. There are times in a chapter that you think she has already explained something previously- and she is explaining it again, but that is what we need, and she knows it. Jesus did that, he would speak a parable and then speak two more similar ones in case we missed it the first time. Melissa knows we are the "People" who miss it the first time. The first time we miss it because we can't see through our tears, or fears, or lack of ability to pay attention- she knows that. All who know me will tell you that I love to read....but what I don't often confess, is that I rarely read anything non-fiction....gasp!! !....I know but listen, I've done enough academic reading in my time that I feel that my love of fiction is totally justified. Another thing I try to keep to myself but that my good friends know is that I'm not all that emotionally transparent. I mean, I stink at it. You don't make it to be a 42 yr old single female without having your emotions bruised enough t All who know me will tell you that I love to read....but what I don't often confess, is that I rarely read anything non-fiction....gasp!! !....I know but listen, I've done enough academic reading in my time that I feel that my love of fiction is totally justified. Another thing I try to keep to myself but that my good friends know is that I'm not all that emotionally transparent. I mean, I stink at it. You don't make it to be a 42 yr old single female without having your emotions bruised enough times to want to keep them tucked away nice and tight!! OH MY MY! I was able to read this book in one week which is saying A LOT about this busy mom. I just couldn't put it down. Each chapter is like it's own little book and I could hear Melissa's voice reading the words to me in my head (creepy I know but if you have ever watched her videos you will totally get me I promise!). Melissa is REAL, RAW, and TOTALLY relatable in every topic which she wrote about. I kept saying to her (as if she was right beside me) Me too sister. Me too. I cried, I laughe OH MY MY! I was able to read this book in one week which is saying A LOT about this busy mom. I just couldn't put it down. Each chapter is like it's own little book and I could hear Melissa's voice reading the words to me in my head (creepy I know but if you have ever watched her videos you will totally get me I promise!). Melissa is REAL, RAW, and TOTALLY relatable in every topic which she wrote about. I kept saying to her (as if she was right beside me) Me too sister. Me too. I cried, I laughed, and spit out my drink a few times, but I finished the last page upset that there wasn't more. If you want a great book that you will not want to put down or find yourself reading it again because it was JUST THAT GOOD....then this is a book for you! Trivia About Eat Cake. Be Brave. Quotes from Eat Cake. Be Brave.